Here’s a great infographic from WebpageFX that shows what happens to popular online accounts when you die. Evan Carroll is an author, speaker and UX strategist who works to make digital experiences more personal, more emotional and more effective. 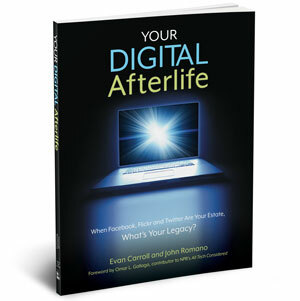 A leader in the developing digital legacy and personal archiving arena, Evan is author and co-founder at The Digital Beyond and co-author of the book, Your Digital Afterlife: When Facebook, Flickr and Twitter Are Your Estate, What's Your Legacy?. Evan has appeared in numerous media outlets including The New York Times, NPR’s Fresh Air, Obit magazine, NPR’s Here and Now, Fox News, CNN and The Atlantic. 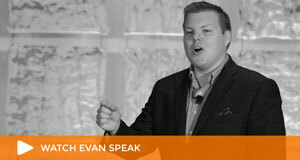 A frequent speaker on both marketing and digital legacy, Evan has presented to audiences at SXSW Interactive (2010-2012, 2014), the Library of Congress, and the Internet Archive, among others. Evan holds BS and MS degrees in Information Science from UNC-Chapel Hill’s School of Information and Library Science. He can be contacted by emailing or via Twitter @evancarroll. Evan's personal site is www.evancarroll.net. Subscribe to receive our posts via email. Do You Have Digital Liabilities? What happens to your LinkedIn account when you die? Evan Carroll is an author, keynote speaker and marketing technologist who works to make digital experiences more personal, more emotional and more effective. He offers keynotes and workshops on technology, customer experience and digital culture. Evan has appeared in numerous media outlets including CBS Sunday Morning, NPR’s Fresh Air, The New York Times, the Atlantic, Popular Science and PBS Newshour. © 2019 The Digital Beyond. All Rights Reserved.